While on a trip to Rajasthan, I was searching for a pleasant destination to escape from the hot summers. 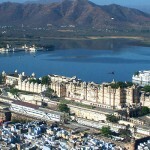 What else could be more beautiful and romantic than the ‘City of Lakes‘- Udaipur? Lakes and watercourses not only provide a perfect backdrop to Udaipur, but also give a sense of relief. These lakes add some more beauty and appeal to this charming city. As I arrived Udaipur, I wqas welcomed by royal palaces, swaying trees, balmy weather and sparkling lakes– a perfect mixture for relaxing holidays. 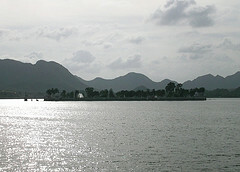 Udaipur. With 3 miles of length, 2 miles of width and 30 feet of depth, it is cradled amongst hills, gardens, havelis, temples and ghats. The mesmerizing beauty of Lake Pichola is capale of making you fall in love with it. I was also surprised to see the splendid beauty of Udai Sagar Lake. Built between 1559 and 1565 by Maharana Udai Singh, the lake extends to 4 km in length 2.5 km in width. The dam on this lake is connected to Berach River. I loved spending some quality time alonside the serene waters of this lake while having lunch at a small restaurant/dhaba. enjoy the tranquil beauty of this lake. On the other hand Jaisamand Lake, 52 km southeast from Udaipur, boasts of being the second largest artificial lake in Asia. It is quite close to the Jaisamand Sanctuary (built in 1957), which serves as a home to several birds, panthers, leopards, deer, wild boars and crocodiles. I also paid short visits to Badi Lake (built by Maharana Raj Singh I in 1684 at a cost of Rs. 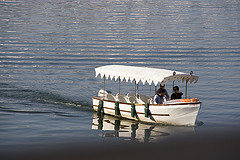 688,000) and Rajsamand Lake (built in 1660) and enjoyed boat-ride in the evening. Such pleasant activities leave soothing impacts on the tangled nerves of the tourists. A few local people told me that Lake Swaroop Sagar, Kuwaria Talaab, Badi Jheel, Dhoodh Talai, Rani Sagar and Kaka Kiwad were also popular watercourses a few years back, but they dried up with course of time. Presently these serve as thoroughfares for the people and grazing grounds for animals. With all these natural attractions, Udaipur is a favourite tourist spot of the honeymooners, and holiday makers. 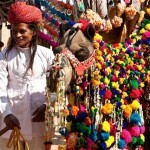 «Next Post Elephant Festival Celebration In Jaipur Is Calling!